Manchester United legend Ryan Giggs, who made over 1,000 competitive appearances for the club has revealed the one team that he found extremely difficult to play against, speaking with at a UEFA Champions League trophy unveiling event at Johannesburg, South Africa. The Welsh icon earmarked the treble winning Barcelona team of 2009, led by current Manchester City manager Pep Guardiola as the greatest team he had ever come across. The Blaugrana were a force of nature in their treble-winning season and had stalwarts like Iniesta, Xavi, Puyol, Gerard Pique and obviously one of their greatest No.10 of all time, Lionel Messi in their ranks. Giggs saw his name being etched into the history books in 1999, when the Red Devils led by Sir Alex Ferguson, pulled off an epic comeback in the second half, scoring two times in the injury time. Coincidentally, he lifted the coveted trophy in front of over 90,000 fans at the Camp Nou, home of the team that inflicted a loss on United in 2009 and 2011 finals of the competition, with Messi finding the back of the net on both the occasions. 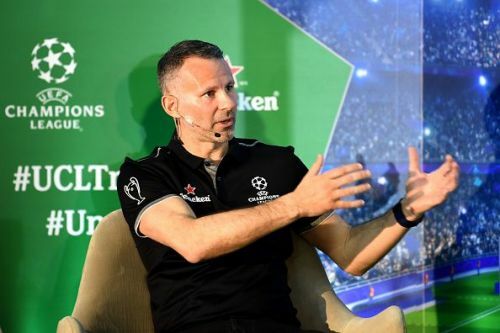 Giggs, who was in South Africa as part of the UEFA Champions League Trophy Tour, presented by Heineken, talked openly about the team that has given him nightmares since he lost two big games to it. He said that the intimidating Barcelona side, which had the top players in defence, midfield and the attack as well, was the best opposition he ever played against in his entire career, which mind you spanned across 24 years at the Old Trafford. “In 2011, sometimes you just have to hold your hand up; we were up against a great team." "I would have liked to have won more [Champions League titles]. Of course, we were in four finals - we got beaten twice by Barcelona; probably the greatest team I have played against... Messi, Xavi, Iniesta, Puyol, Pique - really top players in a top team." “That [2009 final] was probably the most disappointing game of my career." Giggs took over the Wales Men's Football team as the head coach in January last year. Now he would like to make an impact at the EURO 2020, having failed to qualify for the World Cup last summer.